I really hate how our elm trees drop their leaves so much earlier than other trees - makes for icky bird baths and a messy yard! Not to mention their 'fruits' all over the yard. I'm glad the squirrels are around to help keep those picked up. My fountain / bird bath on the back porch simply didn't want to 'spout' water any more. I emptied the bowl, cleaned out the water pump, wiped everything down, filled it back up with water, plugged it in and. . . Nothing. Seriously??? Nothing? Sigh. . . Repeat. Except, this time, I focused on the tube from the end of the birdies mouth to the pump. Success!! A can of air came in handy getting all the algae out. Yech! I also learned that you can put the tiniest bit of bleach into your fountains (I used about a tablespoon for my 2-1/2 gallon bowl) to help keep the algae from growing. Hopefully that will help. I'll keep you posted. Oh, I don't think the bleach thing is a good idea in fountains that birdies use. I used my usual cheesecake recipe and added a few chocolate chips (toss them with some flour to help keep them from sinking during baking). 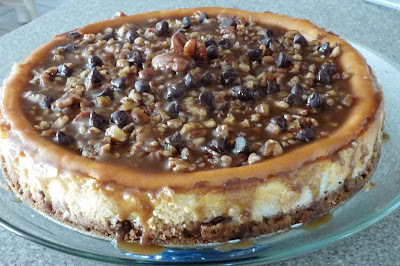 Once it was cooled, I topped it with chopped walnuts and some of my homemade caramel sauce - delish! More than delicious - Extra Special YUMMY Goodness! In a heavy saucepan, mix sugar and cornstarch with 1/4 cup water until smooth. Stir in cream and corn syrup. Cook over medium-high heat until bubbly, stirring frequently (mixture may appear curdled). Cook and stir for 2 more minutes. Remove from heat. Stir in butter and vanilla. Can serve warm or cool over ice cream, cheesecake. . .